My ReSound Online is an exciting new E-Commerce platform for quick, easy and convenient access to the full ReSound product portfolio. 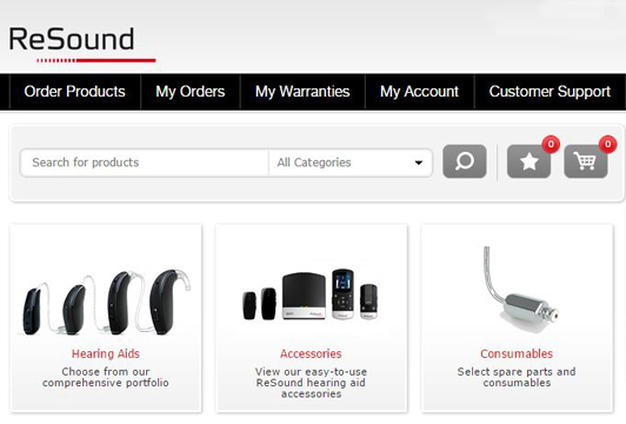 This new and easy to use website allows you to place orders and access your ReSound account 24 hours a day, 7 days a week. We have some more exciting things to which will be available soon on the website, so sign up today! There are so many benefits of using My ReSound Online. With the ability to order online 24 hours of the day you have the freedom to plan your day and use our services whenever it best fits your schedule. You no longer have to call us during business hours to place your order, you can do this at your convenience, anytime and anywhere! Not just online ordering, it’s also an information portal. Access your Account and all the details such as view or download your order history, check invoicing, warranties, payments, credit balances and so much more. Once your account has been activated, you are able to set up your employees with specific access to functions in the system. This gives you the ability to tailor the rights for each individual employee. With the website being so easy to use, you can have more people in your team able to assist with the admin side of ordering, which means you’ll be free to spend time on other aspects of your business. Our aim is to make your experience as simple and fast as possible. So although the system is simple to use, it is sophisticated in its features. You’ll never be able to order something that doesn’t match with the product. All items are configured so only the valid options for each product are presented to you. So whether you’re placing an order for stock purposes or an individual patient order, you’ll know it’s going to be right. Once you have configured your first few orders you choose to add them to your favourites and use them as baseline for future orders, making it even faster next time you place an order. Our online ordering service is an extension of our Customer Care team. If you require any assistance during the system, our friendly Customer Care specialists are on hand to offer live support from 8:30am to 5:00pm AEST, Monday to Friday. Your Area Manager is also available to assist you. Hang on a sec…what about Earmoulds & Custom Devices? Choose one of the following ways to register for access to the website. Once registered you will be provided with a one on one training session. 1. 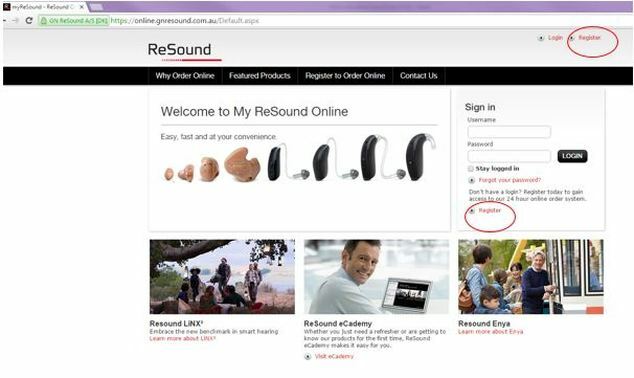 Go to online.gnresound.com.au and complete the form on Register to order online. 3. Contact your ReSound Area Manager who will also be able to assist you.